The first-generation Camaro debuted in September 1966, for the 1967 model year, up to 1969 on a new rear-wheel drive GM F-body platform and was available as a two-door coupé or convertible with 2+2 seating, and a choice of 230 cu in (3.8 L), 250 cu in (4.1 L) inline-6 or 302 cu in (4.9 L), 307 cu in (5.0 L), 327 cu in (5.4 L), 350 cu in (5.7 L), and 396 cu in (6.5 L) V8 powerplants. Concerned with the runaway success of the Ford Mustang, Chevrolet executives realized that their compact sporty car, the Corvair, would not be able to generate the sales volume of the Mustang due to its rear-engine design, as well as declining sales, partly due to the negative publicity from Ralph Nader's book, Unsafe at Any Speed. Therefore, the Camaro was touted as having the same conventional rear-drive, front-engine configuration as the Mustang and Chevy II Nova. 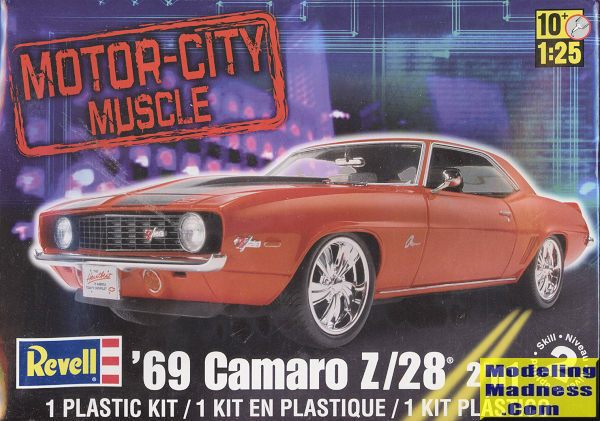 In addition, the Camaro was designed to fit a variety of power plants in the engine bay. The first-generation Camaro lasted until the 1969 model year and eventually inspired the design of the new retro fifth-generation Camaro. Considered by many to be the best looking of the Camaros, the Revell 1969 version is one that has been released several times. This one comes in Revell's current uber-flimsy boxes (undoubtedly to save shipping weight from China) and has a set of bling wheels and tires that are of zero interest to me. However, it also comes with a full stock set up. A dual carburetor V-8 with a nicely done set of header-type exhaust is included. This dual exhaust set up ends up going into a single crossover and then to a single tailpipe. The kit provides a rather complete cooling system and nicely done front and rear suspension with separate shocks. As typical of the time, the rear is leaf springs. The front and rear glass fit from the inside so you'd be wise to prepaint the body. The interior is the same style as US made car kits have had since the SMP days of a tub where one puts in the seats, center console and inside door pieces. Atop this fits the dash with the steering wheel. A firewall fits in the back of the engine bay and then one attaches grilles, lights, bumpers, and other similar external items while mating it to the rest of the chassis. The kit does include, on the very nicely done chrome sprue, the RS grille if you wish to use that. Instructions are well done and you get a variety of decals. Well, by that I mean you get either white or black hood and trunk stripes. You use the ones that best contrast with the color you paint the body. 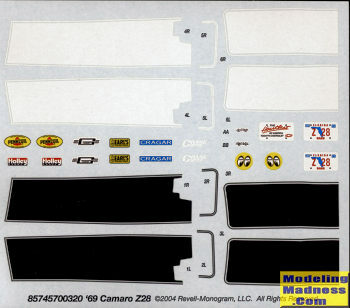 These are the same decals as the initial release of this kit and you also get sponsor decals, though why you'd want those on a street car is beyond me. Decals are well printed and look a bit thick, which is the norm for Revell. This is a popular kit and I see no reason why there won't be more reissues. It makes into a nice model and like all modern Revell car kits, it fits well.